I don’t have an itinerary for Berlin in the way that I don’t really know what reference materials I need. I expect them to find me in bookshops, to come tumbling off shelves in libraries. I have vague lists of things I think I should see and have circled and underlined streets on maps, but really, I’m just stumbling along like usual. So, to have found that today actually encompassed the whole of German and Berlin history is surprisingly organized! Marienkirche was either having a service or was closed for cleaning – my German is too slight to decipher the sign propping the door open. 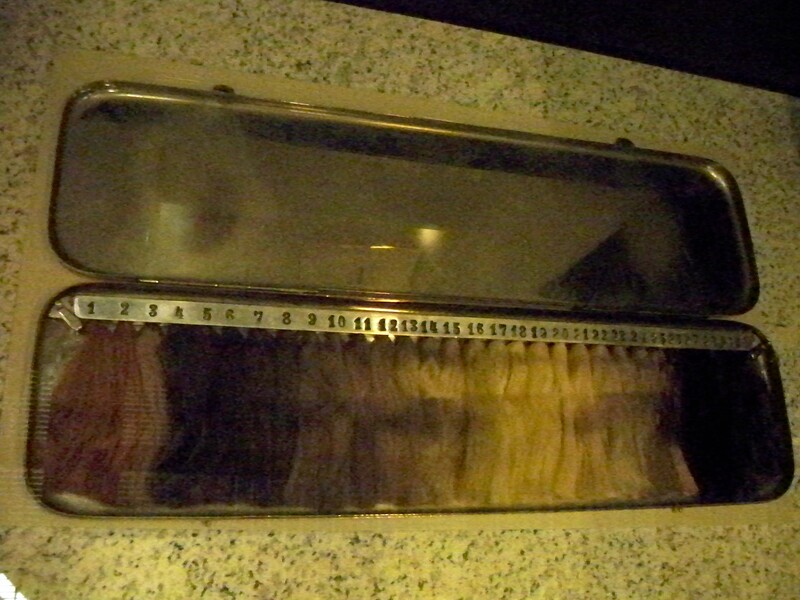 The crocodile of children in matching yellow caps surrounding the door, pointing inside, was another deterrent. The Rathaus, next intended port of call, was closed due to the expansion of the Ubahn. Clearly, today was not the day for plans. I followed the lure of a verdigris tower which was, in fact, two (one behind the other, upright as devil horns or Churchill’s fingers). Nikolaikirche. 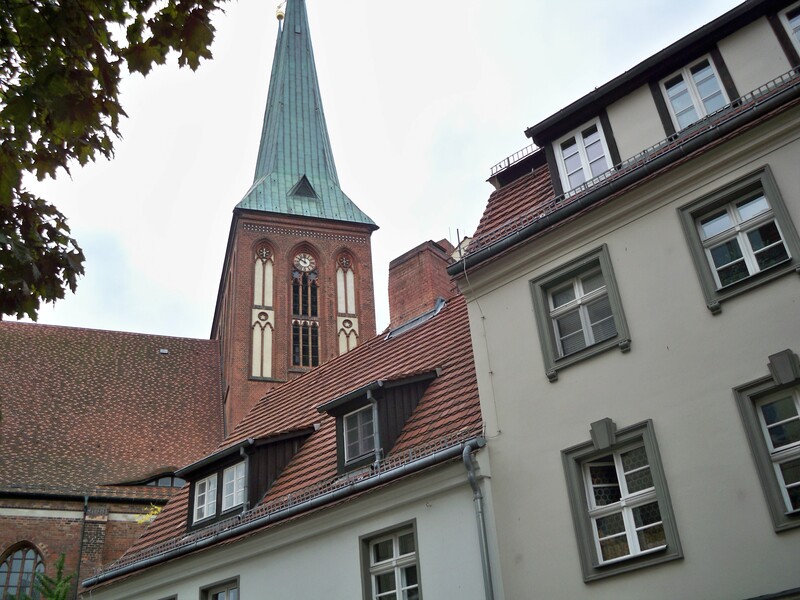 The Church of St. Nicholas, patron saint of merchants and sailors, is Berlin’s oldest church and exists now only after painstaking reparations since reunification. Original foundations show ancient footings and brown-boned skeletons from Berlin’s pre-capital days as a trading post. The church itself was damaged and rebuilt countless times, let alone the “damage” done by the reformation which saw side altars turned into burial chambers and saints removed for memento mori. Nikolaikirche held its last service in November 1939, celebrating 400 years of Reformation, and put itself into safe keeping for reparations; then the war started. Bombing in 1944 and 1945 led to destruction and ruin, until finally the spires and roof collapsed. Nikolaikirche was a shell for decades and its redevelopment, as well as the surrounding Nikolaivierte, is a triumph. If you should be passing, do go in. Don’t worry about the workmen winching ancient paintings up on scraping chains or women by barriers who look like they could eat you alive. Give them 5 euros and go in. I then flew past a number of museums, but couldn’t seem to settle into them. 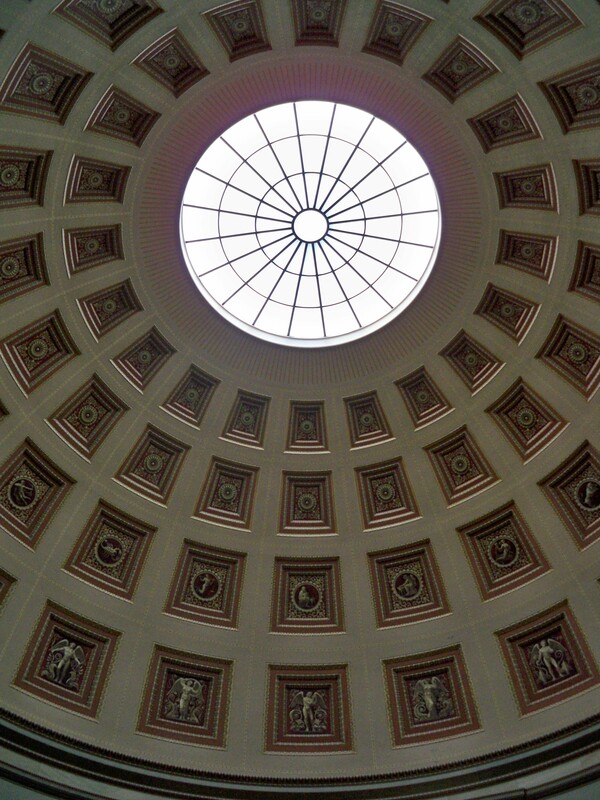 I had a lovely piece of cake at the Alte Museum; here is its lovely dome as proof. I saw the lovely Berliner Dom on the way, but didn’t feel I could do justice to another church so quickly, and certainly not one about to start service with the guard making a gesture of folded hands and bent knees. I walked by the Neues Museum and intend to return to it, and the Altes, too – they are “must sees” in Berlin, and I take my guidebooks as seriously as the next tourist. But no. I could delay a visit to the Deutsches Historisches Museum no longer. I dutifully bought my entrance sticker and then couldn’t figure out how to get in. Then I was detained by a guard earning his keep who decided that my handbag was too big to be trusted in such a marvelous new museum. I thought that whapping him with said bag might write me into history, so I handed it in, camera, iPhone, wallet, pens, notebook stuffed into jeans. Not a good look. And so the 2000 year tour of German history begins! I won’t recount it for you. You probably already know it. It is only I who is still catching up. I will simply tell you some things that I found strange and intriguing. 1. Romans coined the name for the Germanic peoples. We don’t know what they called themselves because they had no tradition of writing. Was I not paying attention in World Civilization as a teenager or what? 2. In a painting of Pope Gregory, Christ pops out of a box, both bleeding hands in the air as if to say – Gotcha! – and so prove transubstantiation to a waiting crowd of monks, who watch in astonishment. One appears to vomit. Also, I did not know about Christ’s grandmother, Saint Anne. Was I not paying attention at Arcadia Presbyterian or what? 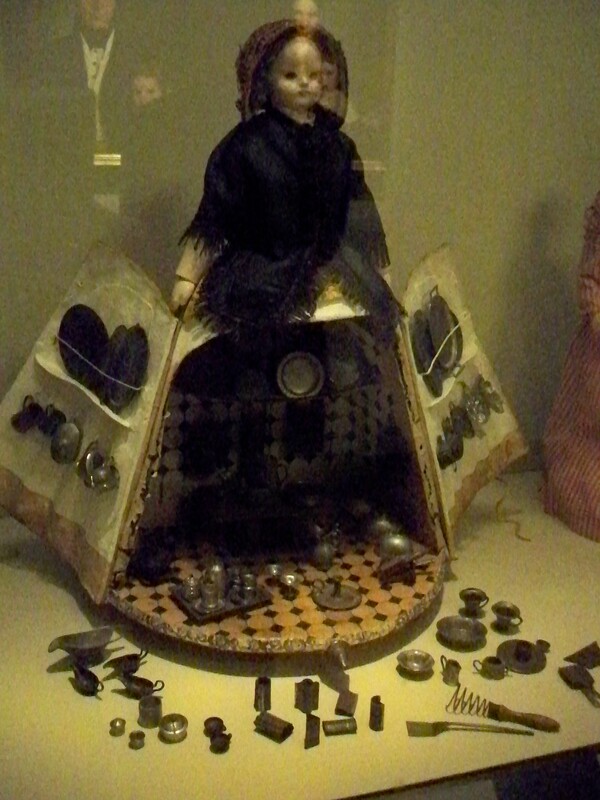 There is a wooden figurine of Anne holding both the pregnant Mary and the baby Jesus in her lap. Truly bizarre. 3. The Ruhr is the essential area for hard coal that will allow German industrialization to develop and finally overtake Britain after 1841. The Ruhr will pop up again. I am working on the ancestry of my character, clearly. 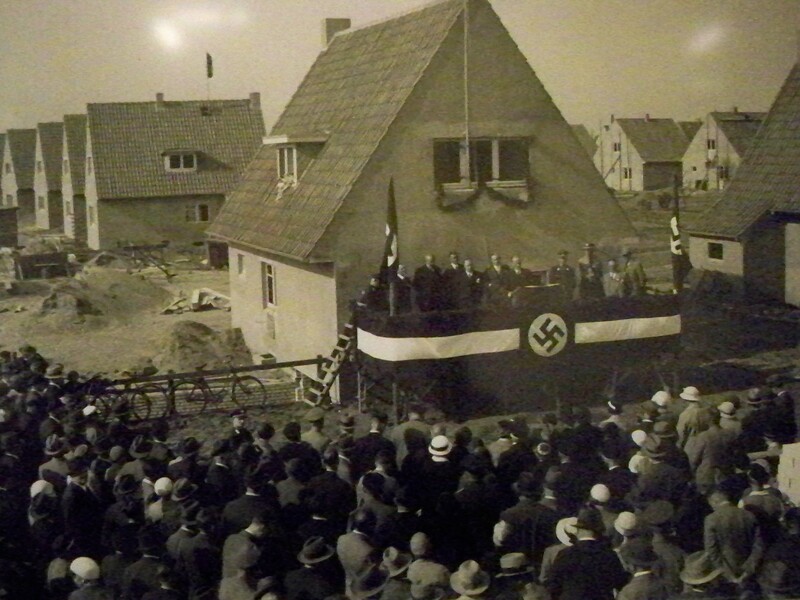 Nazi planned housing, to address the housing shortage that even evacuating Jews couldn’t fix. You lived in a house based on how many children you had, and they gave you a trial period before it was actually yours. 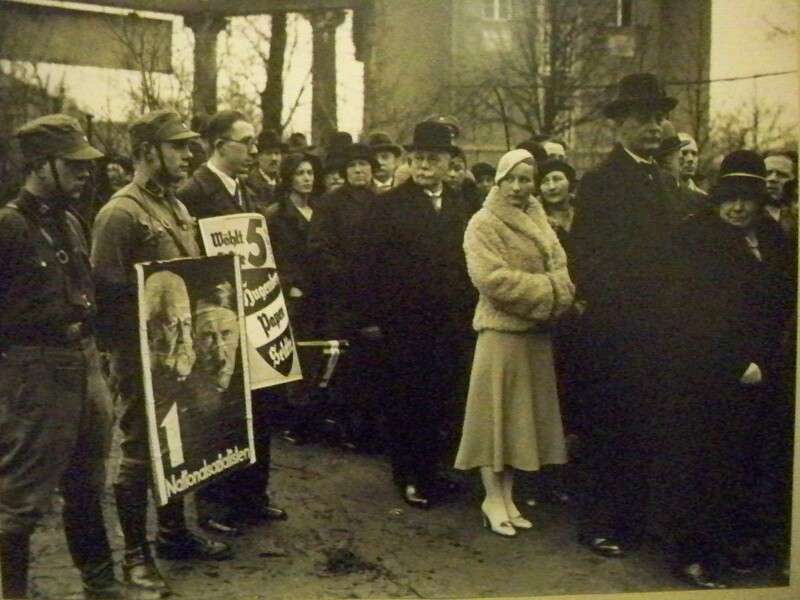 I love this woman’s face during the election of 1923. It is very rare to see faces do anything other than be polite. Even newsreel footage taken of the invasion of Poland sees groups of young men staring into the camera, giving only vague, shy smiles as their world is being pulled up around them. What are they thinking that they can smile? Or is that what human faces do on instinct when truly, truly bewildered? I could go on and on, but it’s probably time to go to bed. 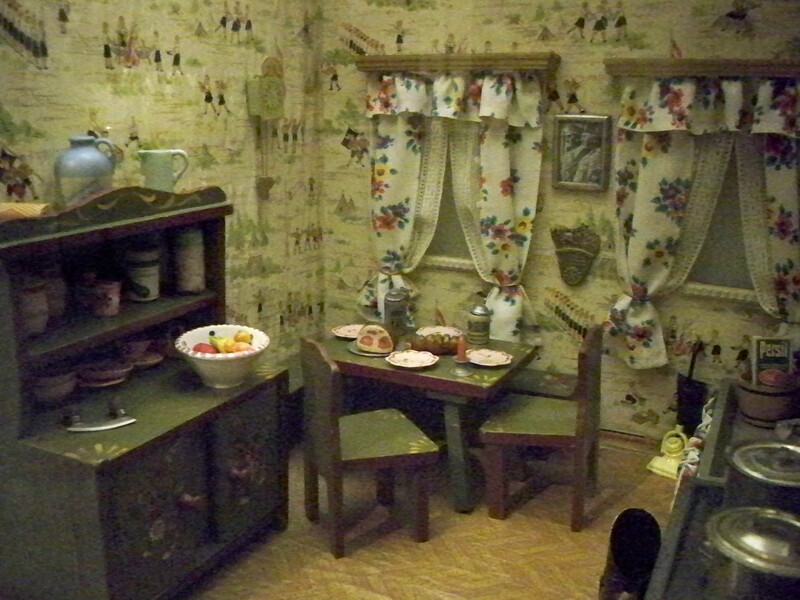 I could show you Nazi bedtime stories, propaganda posters, photographs and artifacts – I have a camera full of them – but I will leave you with this Nazi doll house. You probably cannot see the Hitler Youth wallpaper on the walls. Dark rooms, lots of glass. As usual, I didn’t know what I was looking for, but I knew I would know when I found it. Boy, did I know.